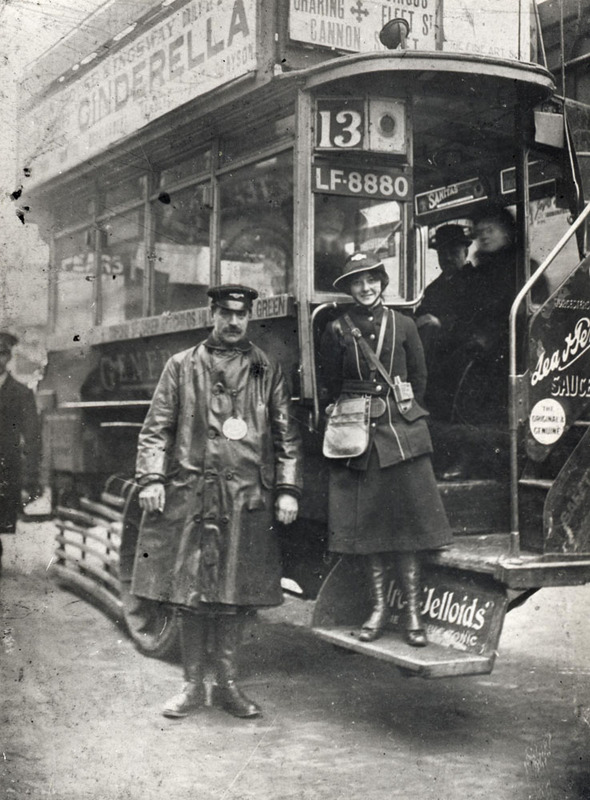 In 2014 London Transport Museum will be remembering the bus drivers and workers of the First World War and we want you to share your personal family stories and mementoes with us! 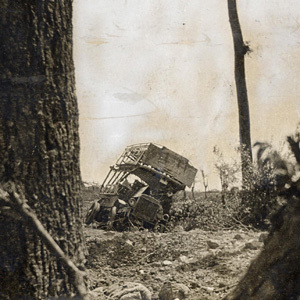 Did any of your ancestors drive a bus during the First World War? Was your grandfather on the buses? Were your great aunts bus conductorettes? If so, we would love to hear from you. In 2014 London Transport Museum will mark the start of the First World War by honouring the unique contribution of hundreds of London bus drivers who went to the Western front with their buses. They played a vital role in supporting the allied armies – moving troops, delivering supplies to the front and taking the wounded to safety. The bus crews, many of whom were volunteers, were recruited into the Army Service Corps, serving under difficult conditions and with the crews often living and sleeping in their vehicles. Despite the hardships, buses were a reminder of home. Within days of the declaration of hostilities in August 1914, the War Department began requisitioning buses from the London General Omnibus Company (LGOC) and other bus companies. By October 1914 over 300 buses had been pressed into military service; by the end of the war over 1,000 buses were in use on the front. Immediately after arriving in France the red LGOC livery was covered over with grey, and later khaki, paint. Charles Lee was one of the first bus drivers to volunteer for war service. In September 1914 he left his bus garage in Putney and joined the crews of 70 London buses sent to Dunkirk. 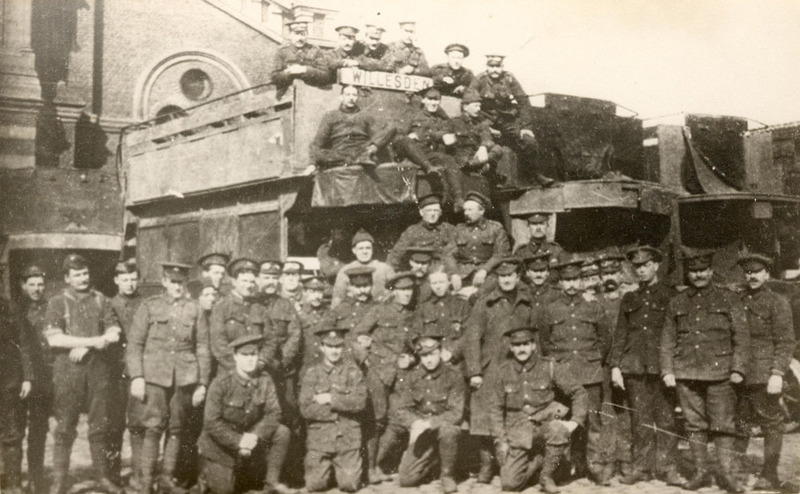 The drivers were attached to the Royal Naval Division. Charles Lee’s unit drove soldiers from the docks to the besieged town of Antwerp. Following the fall of Antwerp, the same buses helped evacuate wounded British soldiers and some were captured by the Germans. For his services in the First World War Lee received four medals: British War Medal 1914-1920, Allied Victory Medal 1914-1919, the 1914 ‘Mons’ Star and the Auxiliary Omnibus Companies’ Association medallion. Joe Clough was one of London’s first black bus drivers. Born in Kingston, Jamaica in 1887, Clough worked for a Scottish doctor, Dr RC White. When Dr White came over to England, he brought Clough with him and after learning to drive as his employer’s chauffeur, he managed in 1910 to secure a job as a bus driver with LGOC. He drove the Route 11 between Liverpool Street and Wormwood Scrubs. In 1915, Clough joined the Army Service Corps at Kempston Barracks and drove an ambulance on the Western front in France for four years. Clough was a popular member of the Army Service Corps and he was the captain of the cricket team. Yet as one of few black soldiers, he was sometimes the victim of racism. Demobbed in 1919, he became a member of the Royal Legion and joined the National Omnibus Company at Bedford, where he lived with his wife Margaret. Between the world wars, Clough would drive an open-topped bus in Cambridgeshire every year on Remembrance Day. Since 1979 our company has occupied the old LGOC factory in North Road, Islington N7 9DP. We have converted the building to provide workspace for more than 300 small businesses. We had thought that all production of the BType had moved to Walthamstow but we have just discovered an article about the factory in Commercial Motore October 1912 describing the function of this wonderful building in great technical detail. It appears that B-Types were assembled here. The North Road factory was the Coachworks with the engines and chassis being made at Wlalhamstow. We also have just been sent a number of photographs showing North Road lined with lorries going to the front (their proud drivers standing alongside in army uniform). We would like to commemorate the part that The Busworks played in the First World War. We have the photographs but I was wondering if you might have any written history about the production line turning from buses to lorries to help the war effort?